Fox News ‘Psycho’ Analyst Asks: Is Obama Waging Psychological Warfare On Americans? 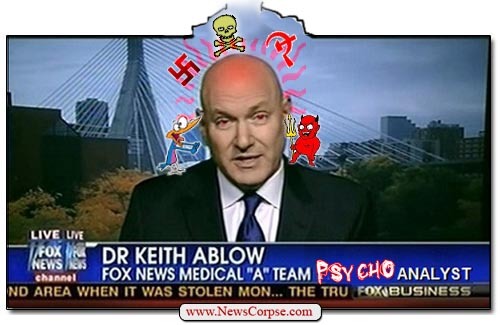 In what may be the year’s most blatantly idiotic expression of puerile Teabaggery thus far, Fox News has published an article by their truly “psycho” analyst, Keith Ablow, that seriously charges President Obama with waging psychological warfare on Americans – the people who elected him twice by decisive margins and continue to approve of his leadership. You may recall “doctor” Ablow as the lunatic who actually praised Newt Gingrich for being unfaithful to multiple wives; who welcomed the pain of Americans suffering through the recession; who repeatedly diagnosed President Obama and others without ever having met them. No wonder he was booted from the American Psychiatric Association. You can almost hear his inner voice warning him to steer clear of the reptilian demons who have inhabited the bodies of otherwise ordinary looking neighbors. He is obviously struggling mightily to prevent his thoughts and organs from being stolen. Of course, huge majorities of Americans believe that the Sandy Hook shootings did indeed reveal a need for additional gun safety measures, but Ablow would probably just attribute that to their being under the hypnotic spell of Warlock Barack. Ablow also says that “Attacking gun rights, I believe, is an element of the psychological warfare.” So in his reverse-logic brain, keeping the weapons of war out of the hands of crazies and criminals is in itself warfare. Ablow concludes by proclaiming that “Americans who value autonomy and free will and free markets and small government” are the targets of Obama’s “black ops technique in an ongoing war against our freedoms.” Black ops are generally defined as covert, extra-legal activities carried out by military and/or intelligence agencies. For Ablow to assign that sort of purposeful deployment of wartime hostility aimed at unsuspecting Americans is nothing short of delusional. It is beyond the conventional conspiracy theory theatrics of nutcases like Alex Jones or Glenn Beck (with whom Ablow co-authored a self-help book). It is important to remember that Ablow is not broadcasting this drivel from an Idaho compound over a ham radio network. He is a member of the Fox News Medical “A” Team and his opinions are distributed by Fox and its affiliated “news” outlets. So the next time anyone tries to pass off Fox as a reputable journalistic enterprise, direct them to this example of the absurd balderdash that they regard as respectable reporting. Fox News continues to prove that their brand of journalism is about as respectable as the fruitcakes who gave us Batboy and alien encounters with former presidents and celebrities. ← Is The IRS/Tea Party Affair A False Flag Operation By GOP Operatives? So, Ablow says that “both the President and First Lady have deliberately ‘planted the seeds of self-hatred and self-doubt’ into the American psyche.” No, dummy, you seem to be confused again. That’s Shlox Snooze. President Obama assuredly is waging Warfare on the Right-Wing Nutjobs. They’ve smeared, besmirched and insulted him done the same to his wife and children and yet Barack remains as cool as the other side of the pillow. Please do not disparage the late lamented Weekly World News. Compared to Fox News, it was a paragon of respectable journalism. Fox “News” is waging psychological war on the left in general and Ablow is suffering, like many on Fox, from Obama Derangement Syndrome.